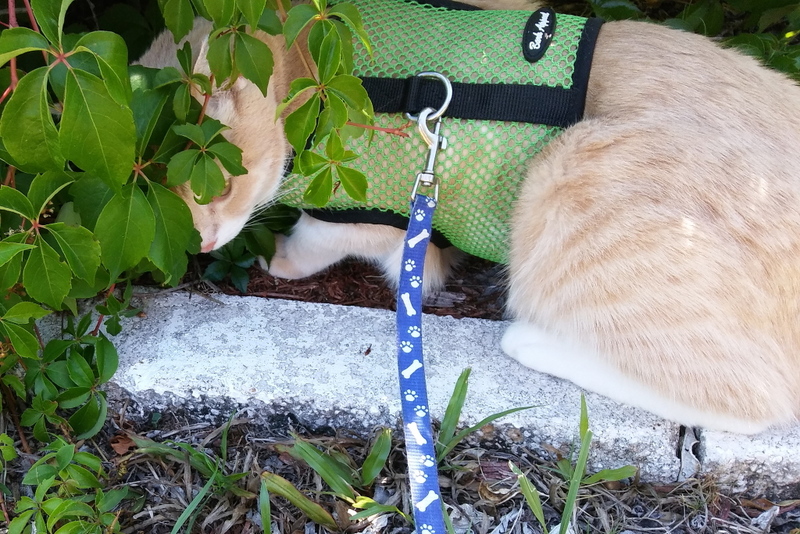 Lately, “taking Frankie for a walk” has become “taking Frankie for a smell.” It seems he has to stop at every bush, shrub or flower and give it a good long sniff before we can move on. That means I have to stand and wait for him to do his business, even though Frankie’s “business” is to smell every plant in the neighborhood. I can’t imagine what he is smelling that would be alluring to a cat. Maybe he was a gardener in a past life. Or maybe he thinks he’s a dog and just has to smell everything. 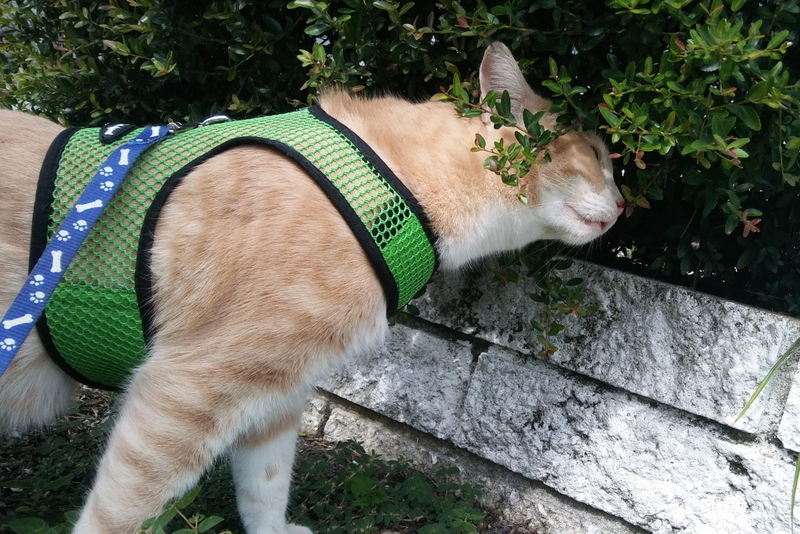 When Chris goes outside he will eat some grass but he does not go out of his way to sniff plants. What do you think? 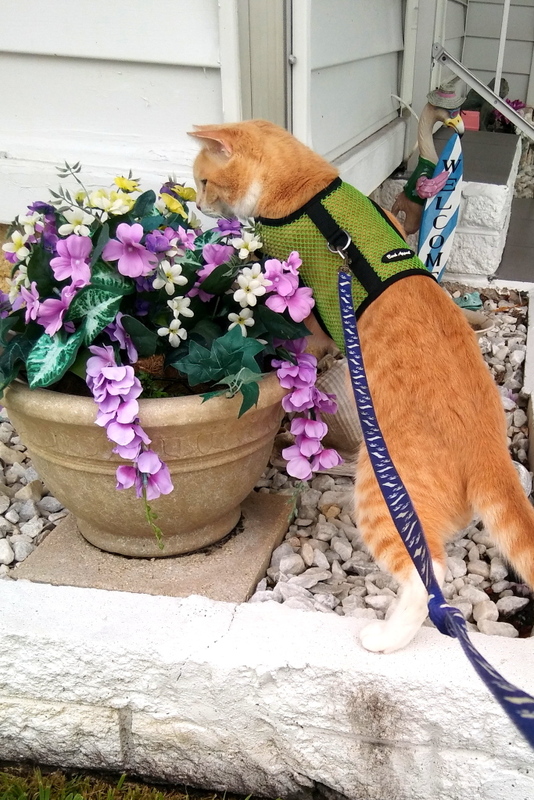 Is your cat a plant sniffer? This entry was posted in Uncategorized on August 6, 2017 by Charles Huss. 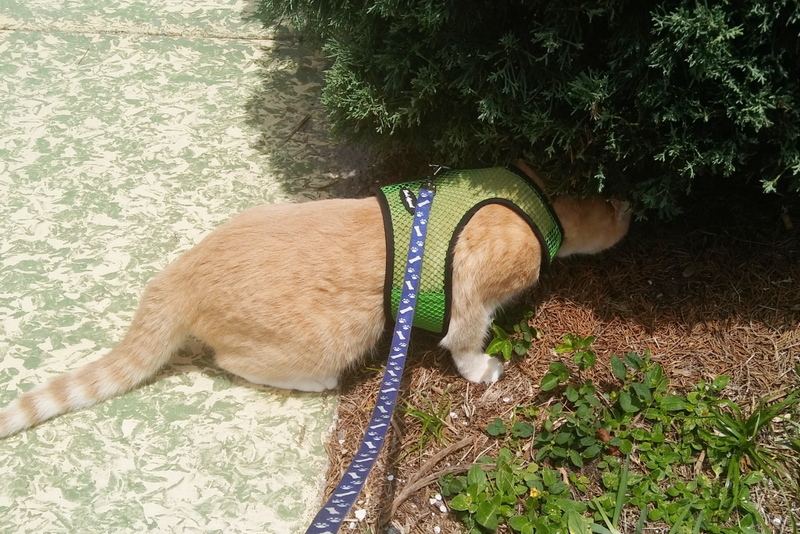 Teddy loves to sniff…..I know in our case it’s because critters have been out and about in the yard and he MUST know where they invaded his territory……deer, squirrels, dogs, other cats, groundhogs, skunks, bunnies – we’ve got it all so there’s an abundance of SNIFFABLES here! My cats sniff everything, and especially like sniffing parked cars! Cute post! Thanks. I have personally seen more than one animal pee on car tires in parking lots. I think it is common. Then those cars drive home smelling like dog or cat pee. My cat Dougy is a sniffer, too! 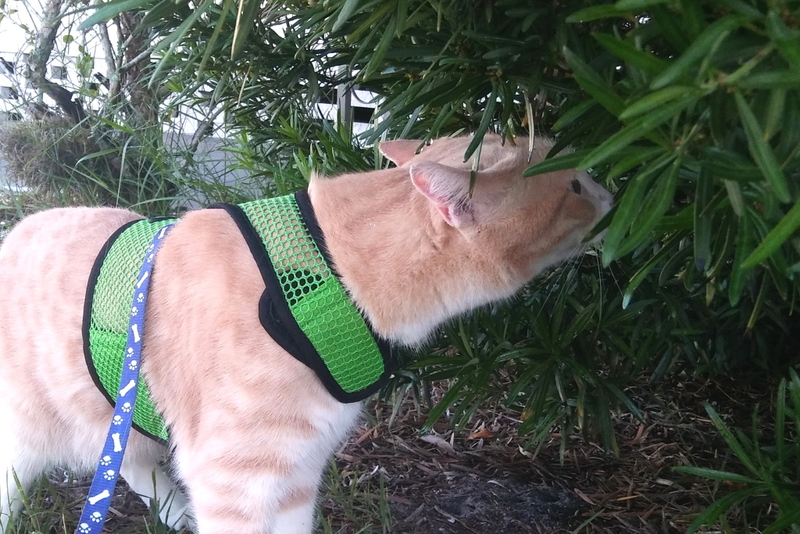 What’s the brand of that cat harness? I’ve had bad luck with others, but this looks like a good, secure one. 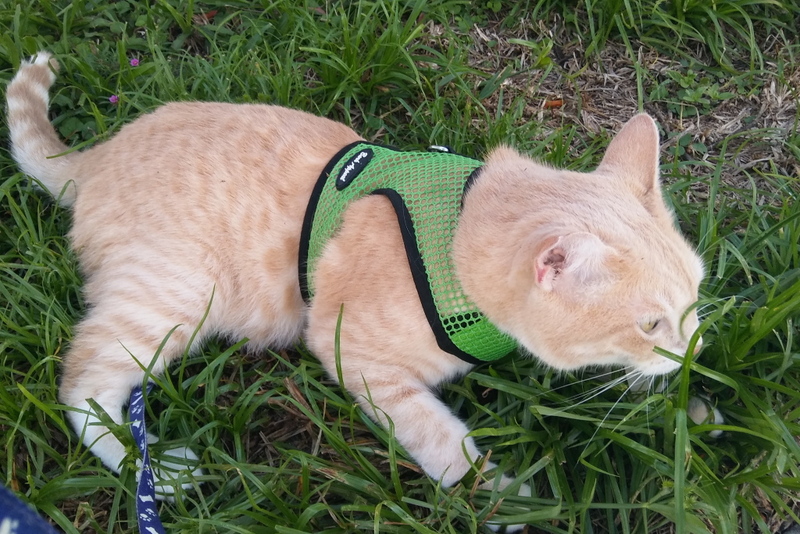 I think both my kitties might enjoy spending time outdoors if I can control them this way, and I could use the walk myself. Incidentally, this was a great treat today! One Frankie photo would have been great, but this series really stands out as one of the better series (any topic) I’ve seen today. Thank you. I like to use the word photogenic for Frankie. 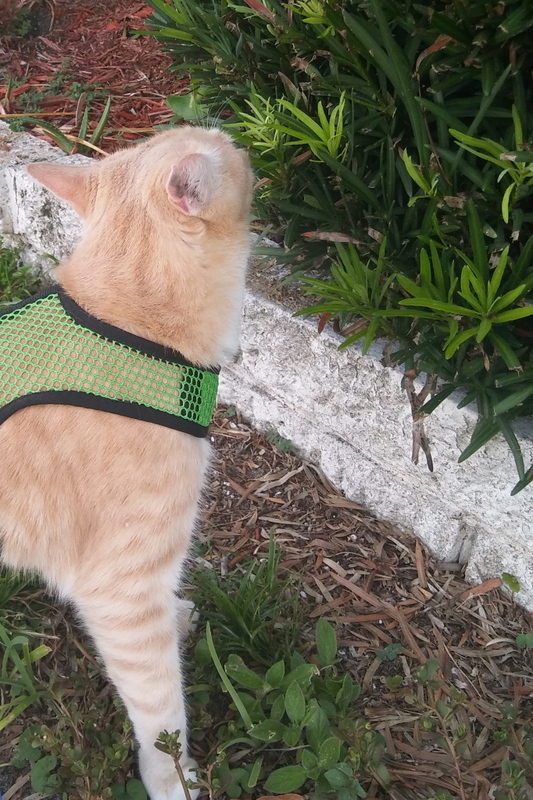 By the way, the harness is called bark appeal, I think. I’m not home so I can’t look. Anyway it is extremely easy to put on, there is a Velcro clasp around the neck and another around the belly, but he can get out of it if he pulls backward hard enough. He hasn’t figured that out yet so he typically doesn’t pull backward unless I’m giving him resistance and I try not to give him too much resistance. Thank you for sharing. 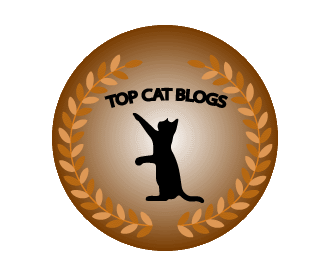 It is a pleasure reading your blog as well, although my busy schedule causes me to miss some of your posts. We agree. You may be part doggie, F. Do not leave a blade of grass unsniffed! It’s our mission! Hahaha… I believe it’s your mission. 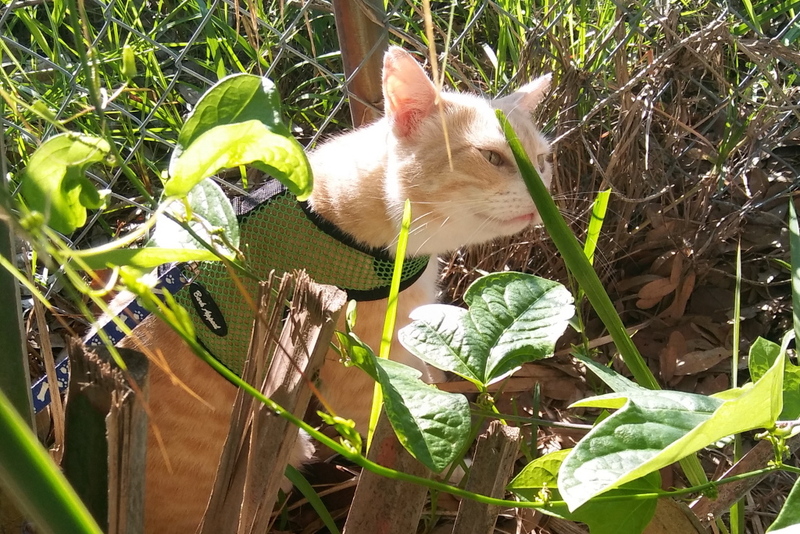 Maybe he’s picking up the scent of lizards that were there. Ha. That would have been funny if he pulled a flower out of that pot. Are you looking for catnip or catmint Frankie? That’s a possibility. You never know with cats. Frankie is so beautiful! 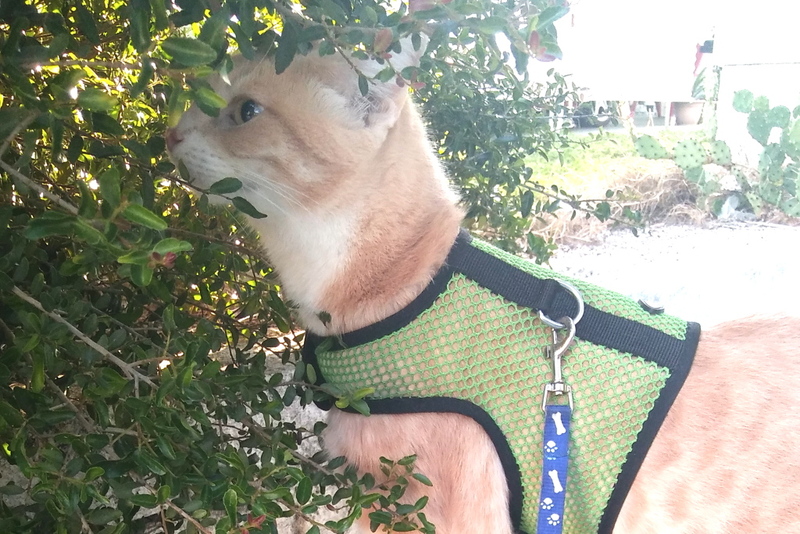 And yes, Kosmo is a sniffer, now when he has courage to walk on a leash. Does he get nervous outside? No, he was afraid of being abandoned, so he just didn’t walk at all, just crawled to the door. 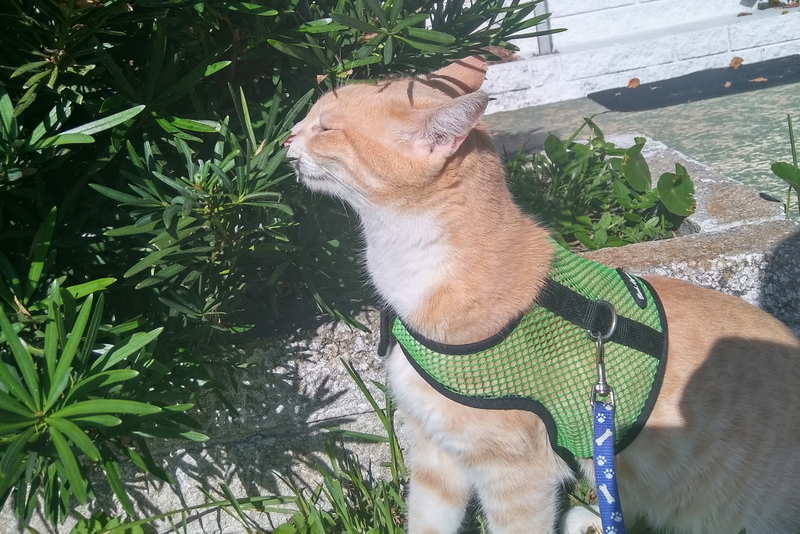 Now it is his third summer with us, so he has learned to trust that we don’t leave him alone and now he enjoys walking and sniffing outside. We don’t know what has happened to him before he walked to our yard and straight to sit on my lap. He was highly educated as a home cat, he knew what is allowed for cats, and his nails had been cut. We tried to find his home, but nobody missed him. I walked from house to house, nobody had seen him. I’m glad he found you. I think it is called bark appeal. It is very easy to put on but it can also meet easy to get out of. When I’m walking him I have to be careful that he doesn’t pull very hard backwards. That’s good to know because I think some of my kitties would go every direction they could to try and get out of a harness! Thanks! Frankie took a couple of times to get used to it but now he doesn’t mind it. That could be. There are a lot of dogs here. I guess he i reading his pee mail 🙂 Are there any dogs in the neighborhood? I see a lot of people walking dogs around here. I think he is smelling other critters – quite possibly other kitties! I thought so as well, especially since we have a lot of dogs in the neighborhood. It just seems he’s smelling higher than a dog or cat would pee, especially since we have no Stray Cats around anymore and most of the dogs are little. I think their sense of smell is almost as good as a dog.